Wayne Allen | Daily Times Lisa Roberts teaching people how to use a Naloxone kit. Monday, Aug. 31, is recognized around the world as International Overdose Awareness Day. This is the first year Scioto County has held an event to recognize the day, where several community agencies came together at Fastop Grocery Store in Portsmouth to learn about programs available in the community. 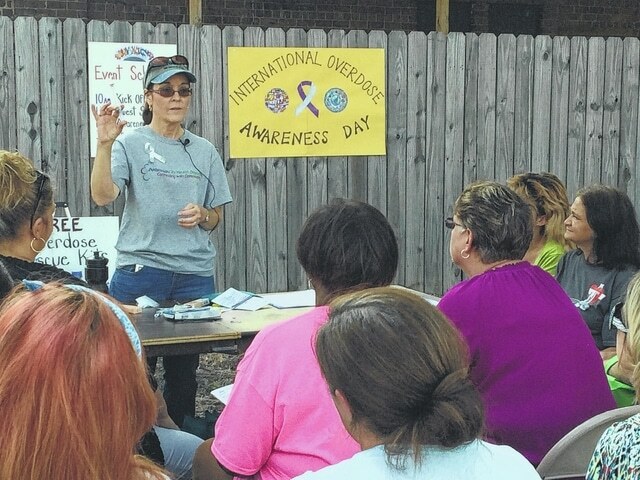 One of the aims of the overdose awareness event was to raise awareness of overdose and reduce the stigma of a drug-related death. The event also acknowledges the grief felt by families and friends remembering those who have met with death or permanent injury as a result of drug overdose. According to www.overdoseday.com, Drug overdose was responsible for 41,340 deaths in the US in 2011. US overdose deaths have increased for 12 successive years. In 2011 and for the fourth year in a row, the number of US citizens whose deaths were drug-related exceeded the number of fatalities in road traffic accidents (33,561). Almost five people per hour died of overdose in the US in 2011. The Portsmouth City Health Department was at the event distributing Naloxone kits. Due to unforeseen circumstances, the guest speaker was unable to attend. Jo Anna Krohn, executive director of SOLACE addressed those in attendance. Other associated events included an awareness march, music and a closing service. For more information about SOLACE find them on Facebook.